In 1995, Chrysler introduced the Dodge Viper GTS-R, a limited-production racing car strictly intended for worldwide GT-class competition. The standard powertrain was a 525-horsepower 8.0 liter V-10, with 650- or 750-horsepower engines available as an option. It clinched the 1997 FIA GT2 championship and the 1998 24 Hours of Le Mans in the GT2 Class. 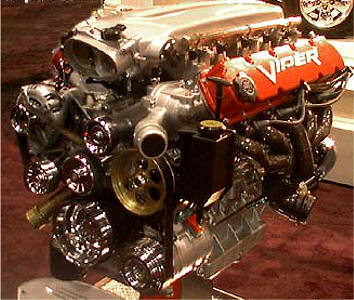 To publicize this achievement, Chrysler built 100 street-legal 1998 GT2 Championship Edition Vipers. It will be painted the same way as the GTS-R, with an aerodynamics package of fascia dive plates, black sill ground effects, a front splitter and rear wing. An enhanced powertrain (see the ACR description) raised performance to 460 hp @ 5200 rpm from 450 hp @5200 rpm and increased torque to 500 ft/lb at 3600 rpm from 490 ft/lb at 3700 rpm. Special badging and graphics include a "Viper GTS-R" banner on the windshield and hood sides and an American flag appears on the upper quarter panel with "FIA GT2 Champion" underneath. 18-inch Michelin MXX3 tires and unique 18-inch one-piece wheels complete with a chrome Viper snake head logo on the center caps complete the visibility options. The interior is black with blue accents on door inserts, bolsters, and the center console and parking brake. A dash plaque highlighting the commemorative series and vehicle identification number (VIN) is mounted on the center console. The interior comes with a five-point restraint system, identical to the restraint system used by Viper Team ORECA, the France-based factory race team that captured both championships. The retail price was $85,200 including destination. Smooth intake hoses and a K&N air filter element increased air flow to add 10 horsepower. 60 pounds were cut by removing the audio system, air conditioning, and fog lights (brake cooling ducts can be put into the openings). Suspension components have been replaced by GTS-R racing units with Meritor (formerly Rockwell) springs. Michelin Pilot Sport high-performance radials (P275/35ZR18 front, P335/30ZR18 rear) mount on one-piece 18-inch BBS wheels for improved traction. The ACR will have the interior enhancements of standard Vipers: power sideview mirrors, cloth-covered sun visors, a satin aluminum finish on gauge trim rings, parking brake handle and release button, shift lever shaft, gearshift knob and inside door release handles. The ACR concept started with the Dodge Neon; the idea is to provide racing enthusiasts with a reasonably priced entry to Showroom Stock classes. Neon ACRs won the Sports Car Club of America (SCCA) Showroom Stock/C class in 1995, 1996 and 1997. Neon drivers also scored 127 wins and 311 top-three finishes in 216 national events; one Pro Rally production-class championship and five Solo Two national championships in 1997. Let us begin by saying that Allpar is in an odd position when it comes to comparing the Viper and Vette, because we've only driven one of them. That said, we can make some observations. The current generation Corvette is fresh from a 2001 redesign, which provided extra torque to the engines (and a little more horsepower), a new top-of-the-line Z06, and upgrades to the active suspension and traction control system. All together, the result is a car that's a lot easier to live with than the Viper - from what we know. The top end Z06 moves from zero to sixty in a Viper-status four seconds flat, according to Chevrolet. Even the base automatic can get there in five seconds, which, given the heavy clutch and stick, is an argument for buying the automatic. 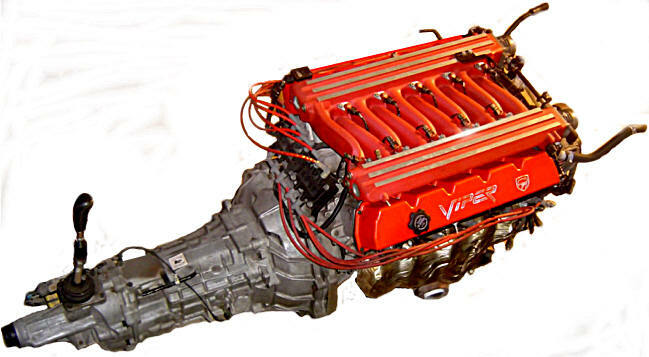 Both Viper and Vette have appropriate sounds for high-performance muscle cars. Both have excellent handling, the Corvette's aided by an active suspension. But only the Vette has a dry weather traction control that makes extreme acceleration easy even for the novice driver. The active handling also makes the car much easier to handle, an important consideration for drivers not trained to handle racing cars. The Corvette provides spacious accommodations for two, but there's not much space for doodads and gizmos, and the hard-to-open center console is very shallow. Passengers can reach back into the trunk, since there's no partition, but nothing will stay in place just behind the seats for very long. While the traction control and active suspension make some aspects of driving the Corvette easy, shifting is not one of them. It takes time to get the feel of the heavy shifter and clutch, not to mention the six-gear pattern. A first-to-fourth feature can sometimes get in the way, on both cars. Both interiors are sporty and unique. The Corvette's instrument panel features a well-programmed and easily operated trip computer, alphanumeric readout, and easy to read gauges. The speedometer switches between mph and kph at the press of a button, swinging the needle around as needed (because of this, the speedometer goes up to 200). Pressing an options button allows the driver to set preferences for car locking, seat movement, and other features. The Corvette's main control drawback is the cruise control stalk, which, in GM tradition, is hard to use, and on the same stalk as the windshield washer, wipers, and headlights. However, when activated - or when the speed is changed - the alphanumeric message area tells what speed it's set for, a nice feature. Unlike the Viper, the Corvette comes in two flavors - base and Z06. The base model can get from zero to sixty in five seconds with an automatic, 4.5 with a manual, making it almost the equal of the Z06. (The Z06 also handles better). However, the base model has a smoother ride, and an automatic transmission for those who want it - in this car, not a major drawback. So which is the king of the hill? In terms of being a daily driver, rather than a racing car, we'd say probably the Corvette. Its dry-weather traction control and active suspension make it much more forgiving for most drivers. It's also a lot less expensive than the limited-production Viper. On the track, though, we suspect the Viper will continue to take top honors for the foreseeable future.